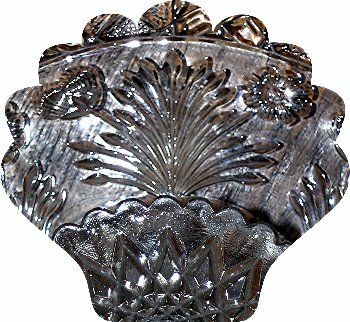 The first extant recording of a patent for pressed-glass furniture knobs was by Bakewell and Company, Pittsburgh, on 9 September 1825. These would have been used on the side-tables with rope-turned legs of the American Directory style or on the in-coming heavier Victorian chests-of-drawers. 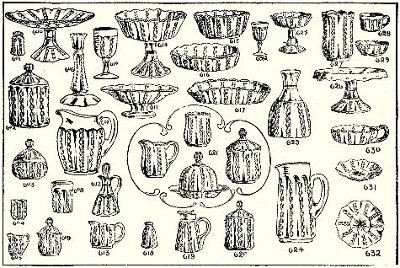 This technique permitted the manufacture of more and more useful forms to include all sorts of dishes, for an ever-increasing demand for social specification  a separate dish for celery, pickles, sweetmeats, toothpicks, fruit, spoons; as well as knife rests, nappies, water glasses, wine glasses and so on, as illustrated in these pieces from the Eaton's catalogue of 1901, in which cake-stands, "as brilliant as cut glass," sold for 55 cents each. 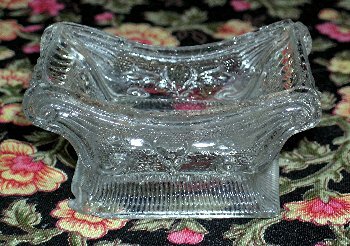 The symmetrical forms were indeed possible, as the pressed glass method was automated to the point that the dish itself was in a set pattern and each successive dish identical. This meant greater savings in labour and fewer mistakes. 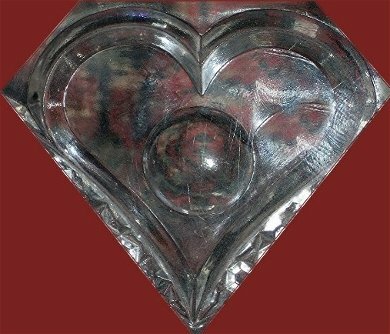 The basic glass shape and ornamenting was now one step, while the cut flint glass mentioned had to be first blown-moulded and then cut by hand. 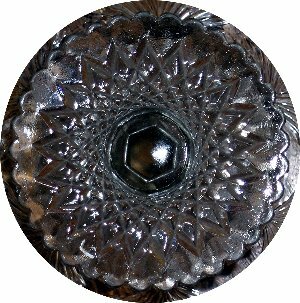 Since cut glass was the rage in England at the time, it was natural that the cheaper pressed glass patterns should imitate their designs. 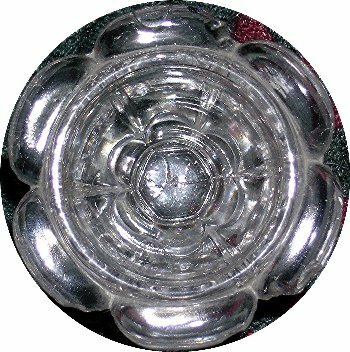 However, in the United States, small dots in the mould were used to give a stippled appearance to the glass, known as lacy glass, popular between 1825 and 1850. 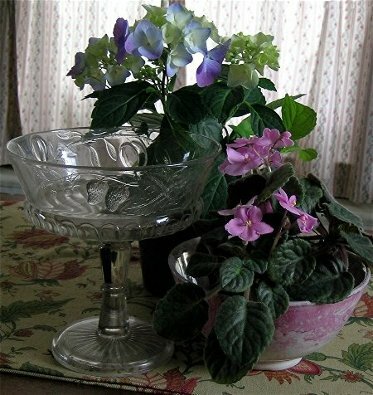 One often hears of "Sandwich glass as a catch-all name for early American glass, but the Boston and Sandwich Glass Company in Sandwich, Massachusetts, 1825 to c1890, was not the only manufacturer. There were others in New England and the mid-west. Sandwich had a wide distribution, however, and might well turn up in Ontario. These are the steps in the manufacture of pressed glass. 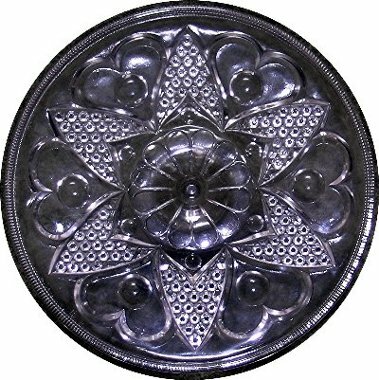 The brass mould was to have the exact shape of the outside of (for example) the tumbler, and the follower or plunger of brass to match the inside of the tumbler. 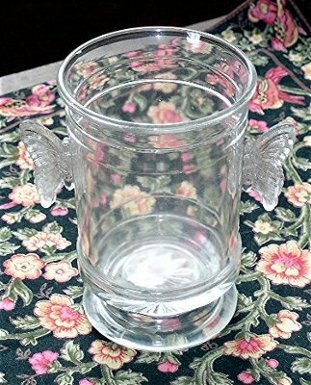 When the two fitted together, the exact thickness of the glass would be left. The operation usually took three men and two boys. The first man gathered the molten glass onto an iron rod and held it over the mould. The glass, in the amount estimated to be needed, was then snipped off by shears and fell into the mould. 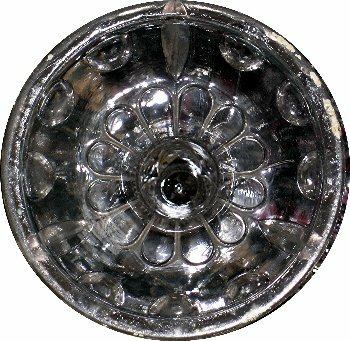 The next man pushed in the follower and thus compressed the glass into shape. The mould was then turned bottom up, and hit, causing the red hot glass to fall onto a stone table. 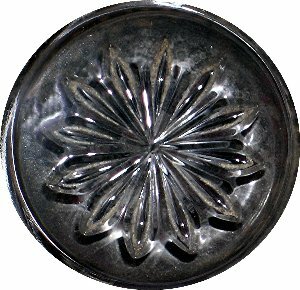 A boy using a small amount of glass on an iron rod, pressed the bottom of the tumbler and held it in the mouth of a glowing furnace, as he turned the rod rapidly. The next man whirled the rod and tumbler, as he sat on an armchair, and removed the roughness of the edge by a small iron tool. The next boy separated the rod from the tumbler and placed it in an annealing oven, where the tumbler slowly cooled to room temperature. It takes longer to describe the operation than to do it, since the whole thing was condensed into 45 seconds. 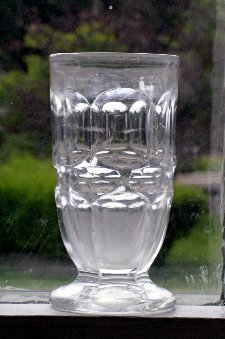 From this technique one can observe certain marks on a piece of pressed glass. 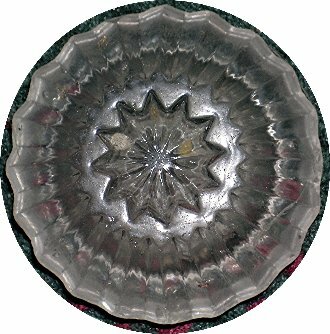 There could be a pontil mark (usually associated with blown glass) where the rod is broken off, and there could be flaw marks, such as a line ¼-inch below the rim. 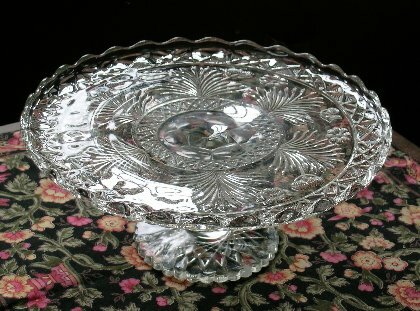 The item usually shows mould marks (seams on the glass) as moulded glass does, but is usually pressed in one overall piece, whereas moulded glass may have a moulded foot applied to a blown bowl. 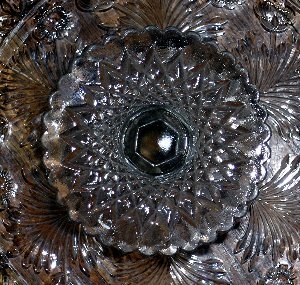 Pressed glass patterns are sharper than moulded ones and, in the latter process, the outside pattern is reflected in the interior shaping, but pressed glass exteriors are in dependent of their interiors. 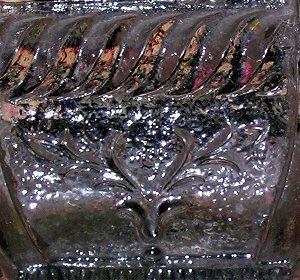 With the technique of fire polishing a glass vessel was reheated to bring about an incipient surface melting, thereby removing marks left by moulds of tools and providing a smooth, even surface. 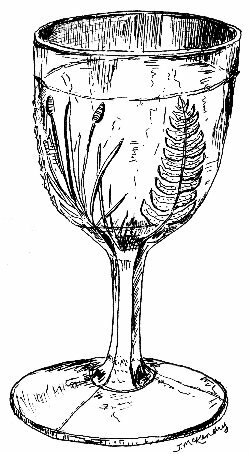 This may explain why a goblet has seam marks on the lower body, stem and foot, but none around the lip area. 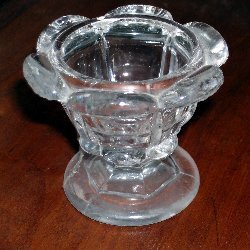 Pressed glass production in Canada was under way post-1875. 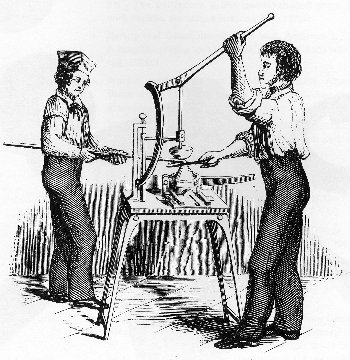 In this country the 19th-century techniques of the hand-operated press continued to be used well into the 20th century, even though by 1900 a totally mechanized machine had been perfected to gather and press the glass automatically. 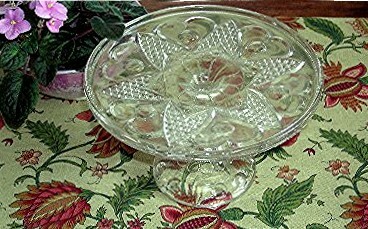 Many glass collectors are interested in pieces made as late as the 1930s. below: two sets of pressed glass from the 1908 Sears Roebuck catalogue. Immediately below, for $3.68 one could purchase 37 pieces - the "genuine Colonial pressed cut assortment, refined, artistic, beautiful." 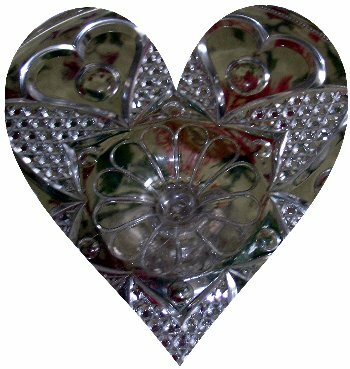 The next set was described as stylish, superb, elegant, massive, brilliant, and available at $3.39 for 48 pieces.